Tis’ the season when the hooks are flying and I’ve been busy crocheting gifts for many on my list. 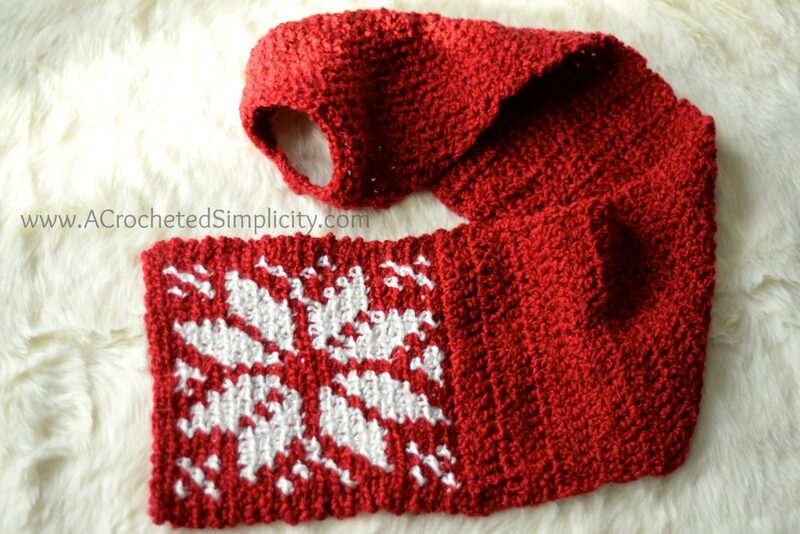 I designed the Snowflake Keyhole Scarf for a special friend who, like myself, grew up in the 80’s with a mom who forced her to wear turtlenecks and now she can’t stand to wear anything tight around her neck. Can you relate? I tend to crochet on the tighter side. You may find yourself needing to go down a hook size (or two) to properly meet gauge, but gauge isn’t as critical with this design. Color Changes: All color changes are worked in the last pull thru of the last stitch of the previous color. Make sure to keep your color changes all on the wrong side of your work. Click here for color change tutorial. Single Crochet Decrease (sc2tog): Insert hook in next st and draw up a loop, (two loops on hook), insert hook in next stitch, draw up a loop (3 loops on hook), yarn over and draw through all 3 loops. 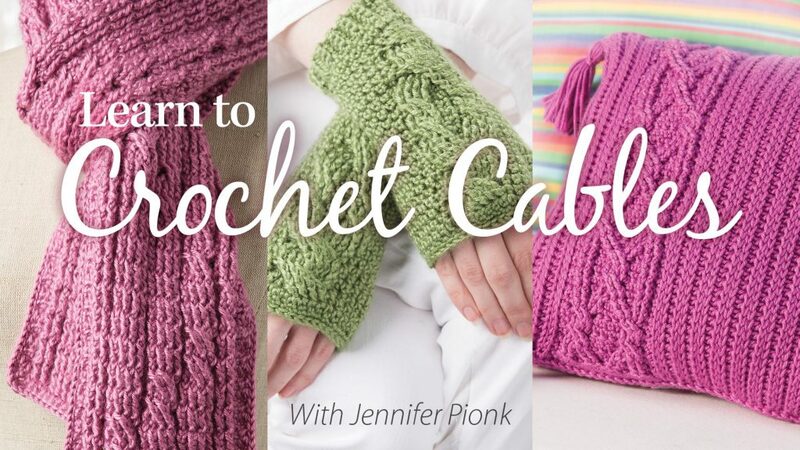 Alternate Double Crochet (alt-dc): After turning your work, do not ch, instead, insert your hook into the first st, yo, pull up a loop, yo, pull thru both loops, insert your hook between the legs of the st just made, (yo, pull up a loop) twice, yo, pull thru remaining loops. Click here for tutorial. 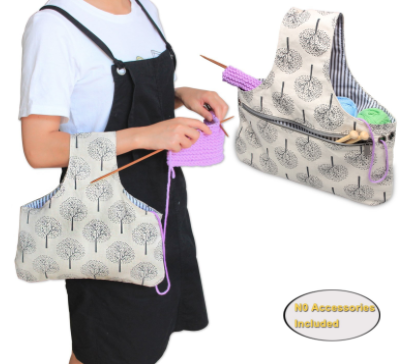 Doesn’t this look like an awesome way to combine walking and crocheting? Click here to check out this one from our affiliates! Tapestry crochet can be worked a couple different ways, but for this design you will be working & reading the graph from right to left for Rows 2 – 19 of the motif. In order to keep the stitches lined up more neatly, and to provide more movement in the fabric, you will be working the motif in back loops only. Reading the Graph Below: Since you will begin each row in the stitch furthest to the right, you will read the graph from right to left each row too. Do not fasten off. Continue on to Scarf. Note: The remainder of the scarf is worked in both loops. Rep Row 2 until your scarf measures 39″. Do not fasten off. Continue on to Keyhole. 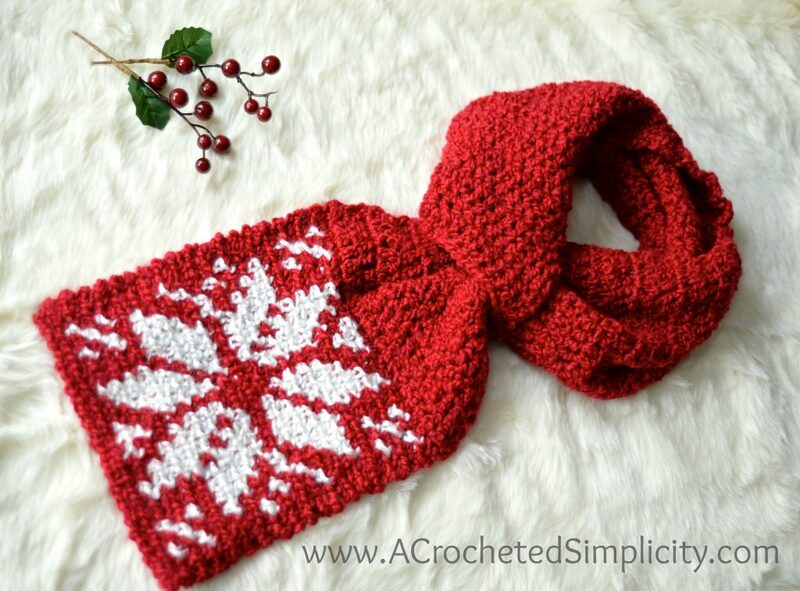 With the snowflake motif facing outward and placed on your left side, wrap the scarf around the back of your neck (from your left to your right). With the keyhole end on top, put the snowflake motif end thru it and gently pull to adjust fit. 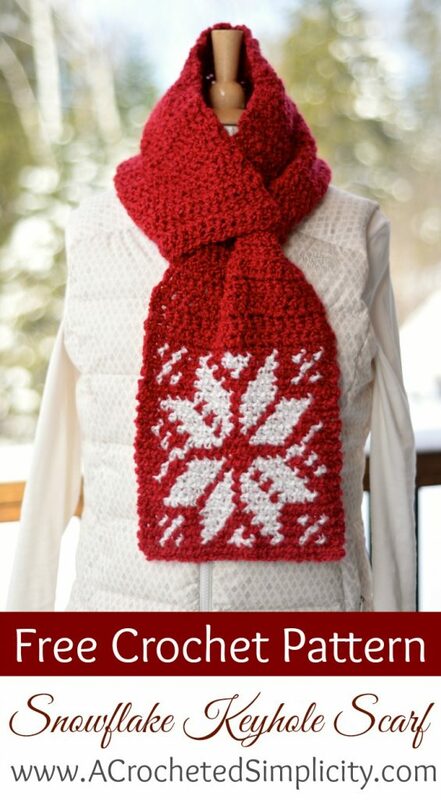 Now that you’ve finished your Snowflake Keyhole Scarf, it’s time to go show it off! Just beautiful. I love the colors and the design and Thank you so much for making it free. I can’t wait to start making it. 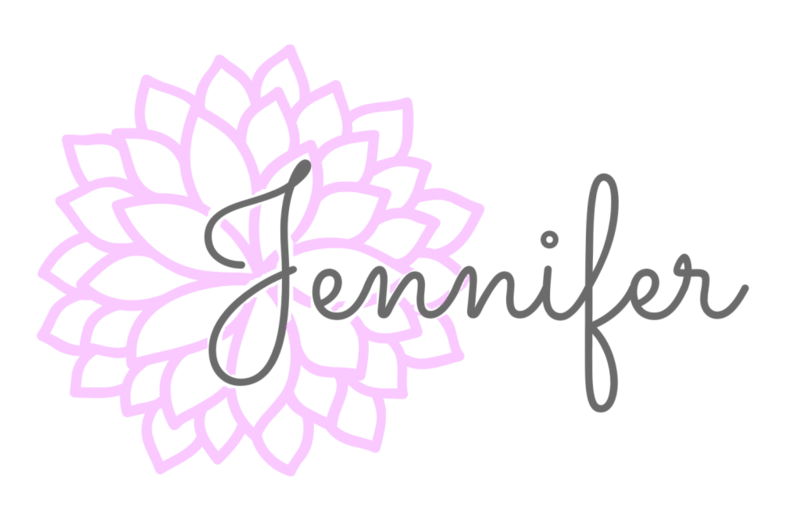 Oh, Jennifer, how did you know I was looking for exactly this pattern?! 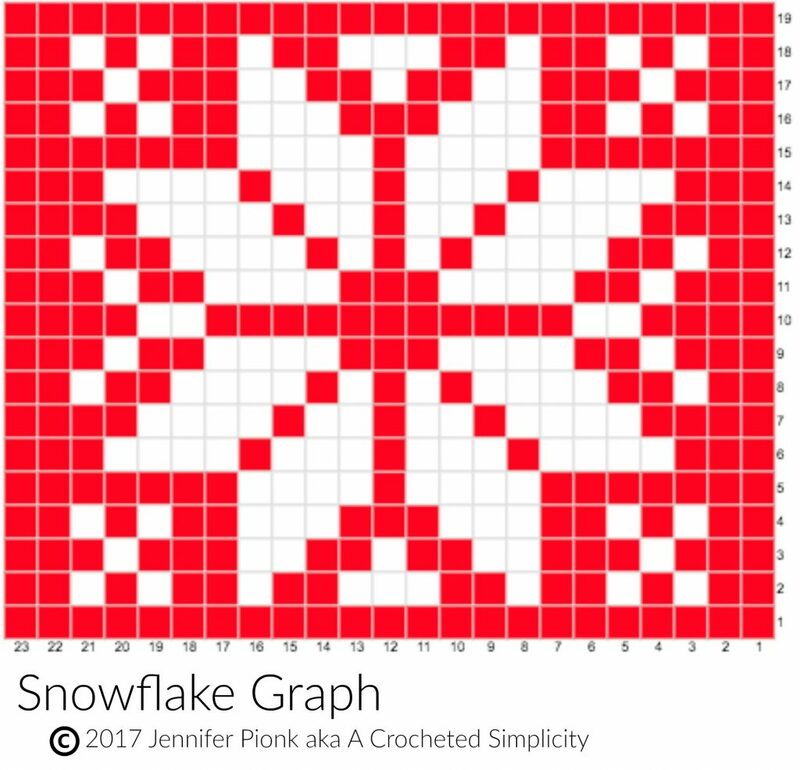 🙂 I saw someone wearing a scarf with a motif like this (NOT handmade) and knew I had to figure out to replicate it in crochet. Thank you so much for saving me all that time or the scarf I made would have been for next year, not this year. And with your talent, I know the scarf will be so much prettier than anything I could have designed. Thank you! I really like the keyhole scarf! Thank you for making it a free pattern. I intend to make a few of these for my friends in Central NY. I miss making warm “snugglies” as I now am retired in southern Texas.